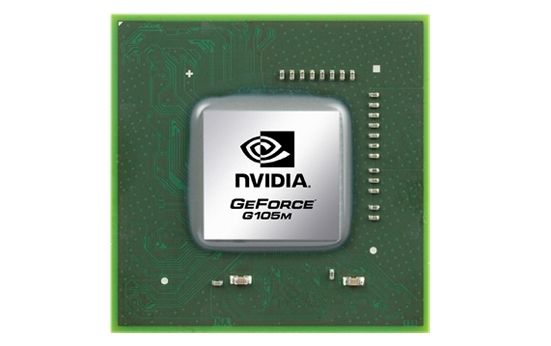 The Nvidia GeForce G105M is a higher clocked GeForce 9300M G and therefore a DirectX 10 capable graphics adapter for small and thin notebooks. Compared to the 9300M G, the GeForce G 105M features only 8. To overcome this downside, it features a higher clockspeed. Furthermore, it integrates the new VP3 video processor (8400M, 9300M G had VP2) with more video features and better hd-video decoding support. In conjunction with the Nvidia 9100M G / 9400M integrated graphics, the G 105M supports Hybrid-SLI (HybridPower and GeForceBoost). HybridPower is a technique to choose between the integrated and dedicated graphics core, if performance or battery runtime is needed. This works only in Windows Vista. Up to now the user has to use a tool to switch between the GPUs. Later Nvidia wants to switch automatically in the drivers. GeForceBoost uses the integrated graphics core of the 9100M G and the dedicated of the G 105M in SLI mode to achieve better frame rates. As the 8400M G, the 105M G features 8 stream processors that do the work of the former dedicated pixel- and vertex-shaders. The unified shaders of Nvidia are 1-dimensional (AMD has 5-dimensional shaders which leads to the higher number of shaders). Modern DirectX 10 games will run only in low details and resolutions. Older DirectX 9 games, like HalfLife 2 or Far Cry run fluently in medium to high details. Compared to desktop graphics cards, the upcoming 9300 GE / GS should be similar, as it will also stem from the G98 core. Still the desktop counterparts are usually higher clocked and therefore faster.